According to Joe Pulizzi, content marketing is "a marketing technique that consists in the creation and distribution of relevant and valuable content to attract and catch the attention of a well-defined target audience, with the aim of encouraging them to become future clients".Content is a fundamental part of inbound marketing, as it is the "bait" we use to attract new potential customers and make them interested in our brand. The content must provide value to the user. We cannot be tempted to speak only about our brand, products and services. Instead of putting the focus on ourselves, we have to think about what the user may be interested in and how we can create something attractive and with the potential to be shared. We must also bear in mind that this value doesn't necessarily have to be of practical utility, it can also be entertaining or emotional. The content must be optimized for SEO. Before starting to create, we must take into account what the keyword strategy of our website is and how we can adapt the content to it and position it in Google. The content must be adapted to the different phases of the conversion funnel. In a first contact, we will seek to resolve the user's doubts in a more general way. As he makes advances through the buyer journey, we can deepen the content by offering him detailed guides, opinions of experts, or testimonials, for example. The content must respond to your branding rather than your products. Everything we publish under the brand has to be consistent with its image, mission and values. But as we explain above, we have to focus on the user and not on ourselves. In general, a good rule is to follow is the "80/20" strategy: 80% of the published content must be focused on the consumer and only 20% must speak directly about the brand, its products or its services. The content must be published regularly. A good content strategy in Inbound Marketing is responsible for planning and distributing new publications over time, so that we can create a constant flow of visits and keep the users interested in the medium and long term. The content is an investment of the future. Sometimes, an article or a video can become viral and generate a rapid boom. But let's keep in mind that content marketing seeks to generate a base to attract visits for the future. What do we seek to achieve with our content strategy? How often can we publish in a sustainable manner? How are we going to integrate the content in the digital marketing strategy of the brand? How are we going to measure the results? In this phase we will value the fit of the content strategy with our SEO, in order to define the keywords of each piece of content. We must also develop a calendar of contents that includes the pieces to be created, who is responsible for preparing them and when they will be published. That is, the process of creating the inbound marketing content according to the plan we have previously prepared. Sometimes, we may encounter unforeseen events or details that we may have not taken into account, so we may have to adjust the plan. In this step it is necessary to include SEO optimization of the contents according to the keywords we have previously defined. The best content in the world will not do us any good if it does not reach the audience we are looking for. Therefore, we need to have a distribution strategy to increase the visibility of the contents. The strategy of content distribution can include both organic techniques (publish the content on our blog or website, make updates on social networks ...) and paid (for example, include content within our social media advertising). Finally, we have to establish periodic controls to analyze if our content strategy is giving expected results. To do this, we will define a series of key metrics or KPIs that will tell us how well it is working. For example, instead of staying in the number of visits, we can focus on the number of leads or conversions achieved. When making the analysis, it may be useful to segment the content according to different parameters, such as the author, the format or the time of publication. Depending on the results we obtain, we will have to make the necessary modifications to our content plan to further optimize the results. Blogs A good tool to publish contents in a structured and regular way. Remember that you can play with different extensions and see what kind of articles work best with your audience. Downloadable PDF A great complement for your articles so that users can enjoy the content in the format of their choice. Ebooks A classic for lead generation. Many brands choose to offer ebooks on topics of interest in exchange for user data. To really work, focus on offering valuable content, using an attractive design, and do not obsess about length. Infographics Here, a visual element is added to the data (or even interactive elements) to make it more attractive and shareable. Videos. This format is very interesting, as it gets increasingly popular among users. Remember that posting live videos through social networks is a good way to connect with your users at a reduced cost. Newsletters An ideal complement to give visibility to your content among your captured users and encourage them to continue moving through the conversion funnel. Webinars Webinars position you as an expert in the sector and are an excellent way to offer value to users who are already interested in your products or services. Podcasts With this option, you can create your own radio program to reach more people. We hope that this information has been useful to you to better understand how content works within inbound marketing and how you can start to implement a content marketing strategy. 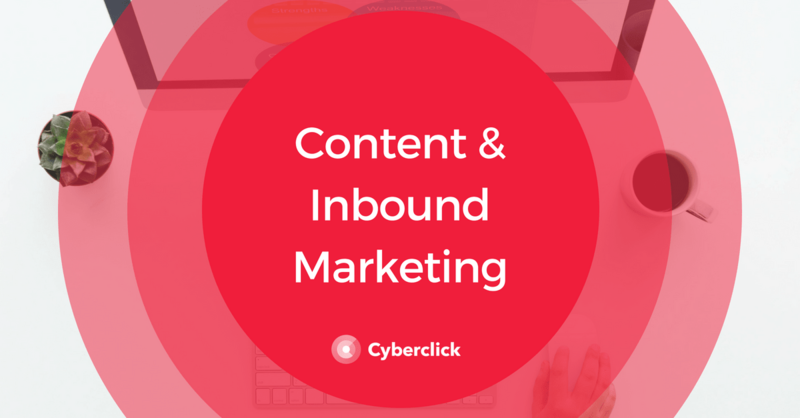 If you want to start your own content strategy to boost the traffic to your website and the results of your inbound marketing strategy, here at Cyberclick we can help you. We will be happy to advise you to help you get the most out of your content. How can we help you with your content?